Liver transplant is the criterion standard for patients with end-stage liver disease. Yet there is no liver transplant in Syria. Traveling abroad for a liver transplant is a luxury few Syrians can afford. There is currently an on-going debate whether to start a liver transplant program using living or deceased donors. In 2003, a new law was enacted, authorizing the use of organs from volunteer strangers and deceased donors. Despite the positive aspects of this law (allowing unrelated donors to increase the number of transplants in the country); the negative aspects also were obvious. The poor used the law to sell their organs to the rich, and this model is in violation of the Istanbul Declaration. To better document transplant communities’ perceptions on organ donation, an e-mail survey was sent to a nationally representative sample of physicians (n = 115) that showed that 58% of respondents did not support the start of liver transplant from live donors, as they fear a considerable risk for the donor and the recipient. Seventy-one percent of respondents believe that unrelated kidney donation has contributed to tarnishing the reputation of transplant, and 56% believe that a deceased-donor program can run in parallel with unrelated organ donations. The interest in deceased-donor program has been affected negatively by the systematic approach of using poor persons as the source of the organ. This lack of interest has affected starting a liver program that relies on deceased donors; especially the need for kidneys is more than livers. Health authorities in Syria were inclined to initiate a liver transplant program from live donors, despite the risks of serious morbidities and mortality. In conclusion then, paid kidney donation in actual effect is actually a hindrance to establishing a deceased-donor liver program. In 2003, a new national Syrian legislation was enacted and authorized the use of organs from volunteer strangers and deceased donors. As a result, the number of kidney transplants performed annually increased more than twice in 5 years, going from 151 transplants (7 per million populations) in 2002, to 350 transplants (17 per million populations) in 2007,1 peaking at 385 transplants in 2010, before dropping because of the crisis in Syria, to only 154 transplants in 2013, as 4 of 8 transplant centers became practically nonoperational during 2011 and 2012. 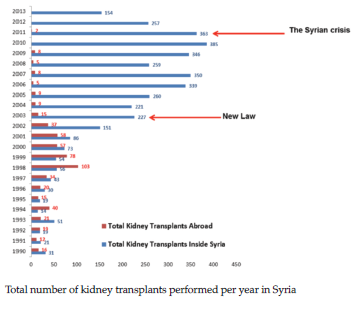 Conversely, kidney transplants performed abroad for Syrian patients decreased significantly from an average of 44% (510 of 1158) of the total transplants (during the 13 years that preceded the enactment of the new law) to an average of 3% (99 of 3351) (during the 10 years that followed the new law) (Figure 1). The Transplantation Society has commended the government of Syria for this pronouncement, and considers it an important testimony in fulfilling the World Health Assembly resolution of 2004. However, despite the government prohibition of private hospitals performing kidney transplants, com-mercialism continues to be problematic in public hospitals (though to a lesser extent), and more importantly, in public centers the doctors and the hospital staff are not part or involved the commercialism that continues after the government prohibition. In contrary to what was going on in the private centers were some of the transplant team were actively involved in commercialism. Nevertheless, during the following years, the unrelated (paid) kidney donation rate decreased slightly by 9% in 2011, as only 61% of transplants (222 of 363) were from unrelated donors. A more significant decrease was noticed in 2013, with 47% of kidney transplants (72 of 154) being from unrelated donors. Therefore, the remarkable initial increase in transplant rate was mainly from unrelated donors. The estimated requirement for liver transplant in Syria is 1000 cases yearly.4 There is an on-going debate on whether to start a liver transplant program using living or deceased donors. So far, there are no precise data regarding the potential for deceased donors in Syria. However, it would be helpful to know for the transplant commuities and health authorities when considering to start a deceased donor program that 2756 people died in road traffic accidents in Syria in 2006. This is approximately 120 deaths per million populations per year. This information could be useful and should be born in mind when studying reporting of all cases of brain death in all the intensive care units across the country to obtain an accurate estimate of the potential deceased donors in Syria. As for the potential for unrelated-living liver donors (vendors); there are no precise data. However, one could estimate the number of kidney vendors between 2007 and 2011, which averaged 235 living-unrelated kidney vendors per year or 10.2 per million populations. Although this figure is for unrelated kidney donors, it may give an indication for liver-unrelated donors, as well. Since the advent of living-donor liver transplant in the late 1980s and early 1990s, it has rapidly increased, particularly in Japan, Korea, and India where deceased-donor programs are not as well established as they are in the Western world. The advantage of living-donor liver transplants is the availability of an organ in the elective setting in the course of a progressive liver disease. This is most applicable in patients with cirrhosis and hepatocellular carcinoma.6 From that perspective, and from the fact that a deceased-donor program is still not available in Syria (and probably will not be in the near future, given the complexity and multiple hurdles that complicate its start), health authorities in Syria are inclined to initiate a liver transplant program from living donors, despite the risks not only is of serious morbidities but also mortality associated with donor partial hepatectomy. With patients dying from end-stage liver disease, the government, in early 2011, took steps to start a liver transplant program in Syria. Their efforts included cooperation with well-known Brazilian and Iranian liver transplant centers. Specialized teams were sent for training in these countries. Unfortunately, the trainers from those countries could not visit Syria, as the political situation in the country is unstable and the project was halted. Conversely, many Syrian physicians are opposed this policy and argue that liver transplant programs should depend on deceased donors because living-donor liver transplants require good experience, which is currently lacking in Syria; such experience is essential to initiate a successful and sustainable liver transplant program, bearing in mind that living donor partial hepatectomy carries considerable risks of morbidity and mortality (as many centers in the West have reported). A systematic review of 214 studies by Middleton and associates7 that evaluated the safety and efficacy of adult-to-adult living-donor liver transplant (specifically, donor outcomes) showed that donor morbidity ranged from 0% to 100%, with a median of 16% based on 131 studies. The complications included biliary leaks and strictures, pulmonary embolism, small bowel obstruction, pleural effusion, and bleeding.7 To date, the surgical mortality risk after a living-donor partial hepatectomy is estimated at 0.1% for left lateral donation and 0.5% for right liver donation.8 The overall death rate for living-liver donors throughout the world is 1 in 250 living-donor partial hepatectomies. Although organ transplant has received much attention in Syria, no data have been published regarding attitudes toward organ donation among the general public and the medical community. 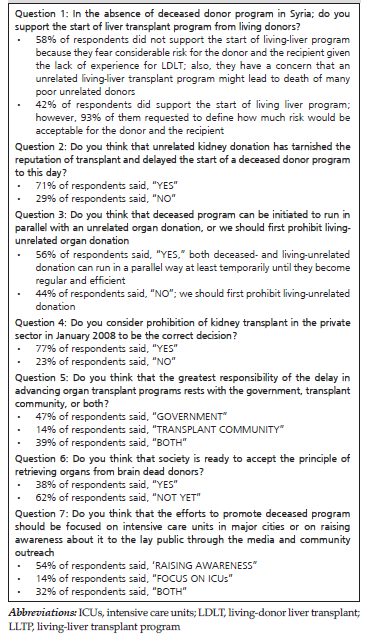 With the aim of documenting transplant and other medical communities’ perceptions on organ donation, an electronic survey consisting of 7 questions was sent to 115 physicians a nationally representative sample. The feedback of the 101 respondents is shown in Table 1. It is unrealistic and unethical to contemplate a living-donor liver transplant program in Syria, because there is a belief that such a program will result in the deaths of live donors, and the poor will be the victims, knowing that poor unrelated donors are coerced into donation by poverty. Therefore, the Transplant Society and the transplant community must define the risks acceptable for the donor and the recipient when undergoing a living-donor liver transplant. In conclusion, paid kidney donation is actually a hindrance to establishing a deceased-liver donation program, because it decreases the urge to begin a deceased program and tarnishes the reputation of transplantation. Saeed B. Current challenges of organ donation programs in Syria. Int J Organ Transplant Med. 2010;1(1):35-39. Participants in the International Summit on Transplant Tourism and Organ Trafficking Convened by the Transplantation Society and International Society of Nephrology in Istanbul, Turkey, April 30-May 2, 2008. The Declaration of Istanbul on organ trafficking and transplant tourism. Transplantation. 2008;86(8):1013-1018. Saeed B .Development of solid organ transplantation in Syria. Int J Organ Transplant Med. 2011;2(1):40-46. Saeed B, Derani R, Hajibrahim M, et al. Volume of organ failure in Syria and obstacles to initiate a national cadaver donation program. Iran J Kidney Dis. 2008;2(2):65-71. Quak SH. Liver transplantation in the developing world. Curr Opin Organ Transplant. 2009;14(5):540-543. Wakade VA, Mathur SK. Donor safety in live-related liver transplantation. Indian J Surg. 2012;74(1):118-126. Middleton PF, Duffield M, Lynch SV, et al. Living donor liver transplantation--adult donor outcomes: a systematic review. Liver Transpl. 2006;12(1):24-30. Barr ML, Belghiti J, Villamil FG, et al. A report of the Vancouver Forum on the care of the live organ donor: lung, liver, pancreas, and intestine data and medical guidelines. Transplantation. 2006;81(10):1373-1385. Saeed B, Derani R, Hajibrahim M, et al. Organ failure in Syria: initiating a national deceased donation program. Saudi J Kidney Dis Transpl. 2007;18(2):270-276. Acknowledgements: The author declares he has no sources of funding for this study, and he has no conflicts of interest to declare.